U.S. Senator Cory Gardner, R-Colorado, made a stop through Craig Thursday night on a tour of the West Slope with his family, including his wife Jaime pictured here holding daughter Caitlyn, daughter Alyson and son Thatcher. 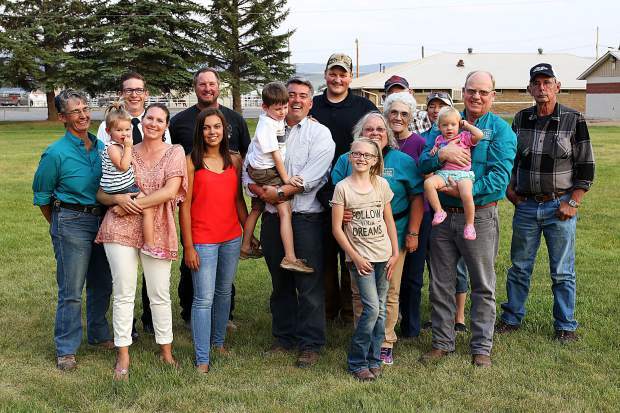 Members of the Moffat County Farm Bureau welcomed the Gardner family with a picnic at the Moffat County Fairgrounds, where Gardner briefly addressed issues including rural economic development, energy and health insurance. U.S. Sen. Cory Gardner, R-Colorado, visited Craig Thursday evening as part of a tour of the West Slope with his family. The Moffat County Farm Bureau hosted a picnic dinner for him at the Moffat County Fairgrounds, where he answered questions and shared a few words about what he’s working on in Washington. “It continues to be my goal to bring back new generations to farming and keep existing generations on the farm and ranch,” Gardner said. Gardner said he is working to “move the BLM out of Washington, D.C. and move it to western Colorado,” with his sights set on Grand Junction. Gardner also addressed energy development, health insurance, rural economic development and trimming federal regulations on business.